In 1567 William Flower, the Norroy King of Arms, conducted a visitation of the County Palatine of Lancashire accompanied by Robert Glover, who was then Portcullis Pursuivant. Flower's manuscript is held at the College of Arms, with a transcript made by Glover being held by the British Library. In 1870 Glover's transcript was collated by the Reverend Francis Raines with information from other sources and published by the Chetham Society. The purpose of heraldic visitations was to regulate and register the use of coats of arms and for this purpose the pedigrees of armigerous persons were recorded. Flower noted the Wardley Hall branch of the family in detail. The pedigree takes this line back into the 13th century, since it starts with Henry Tyldesley of Tyldesley who is known to have been alive at the time of Testa de Nevill (Liber Feodorum) in 1302. Gillow regarded the pedigree as generally accurate, but departs from it in three respects (FN1). First, Gillow suggests that a Thomas Tyldesley has been omitted between Richard Tyldesley and Thurston Tyldesley. Second, Gillow disagrees with Flower as to the names and number of children of Thomas Tyldesley and Jane Birkenhead. 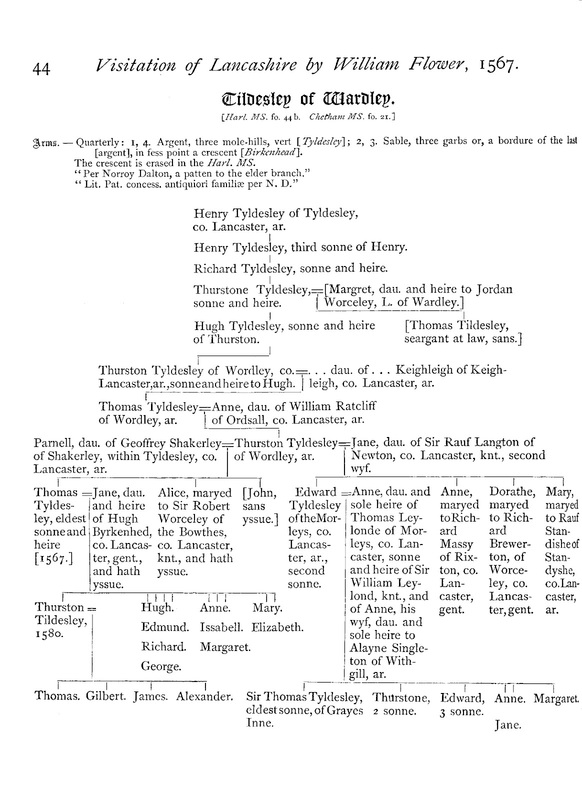 Third, Flower wrongly identifies Thomas Tyldesley, son of Edward Tyldesley and Anne Leyland, as Sir Thomas Tyldesley of Gray's Inn and records a daughter of the marriage, Margaret Tyldesley, who is not recognised by Gillow. Jane Langton is recorded as married first to Thomas Rigmaden of Wedacre and second to Thurstan Tyldesley of Wardley (page 24). Sir Alexander Osbaldeston of Osbaldeston is noted as married first to Anne Sowthworthe of Salmesbury and second to Helene Tyldesley, daughter of Thomas Tyldesley of Wardley (page 34). Margaret Norris is recorded as married to Thurstan Tyldesley of Wardley (page 84). Margaret Standish is recorded as married to Lambert Tyldesley of Garratt (page 102). Hugh Parr is recorded as married to Constance Tyldesley, daughter of Thomas Tyldesley of Wardley (page 120). Helene Ditchfield is recorded as married to Thomas Tyldesley of Ditton (page 123). Margaret Heiton is recorded as married to Richard Tyldesley of Garratt (page 129). Anne Leyland is recorded as married to Edward Tyldesley of Wardley (page 131). Of these eight, three are from branches of the Tyldesley family other than that established at Wardley (4, 6 and 7) and three are from Wardley but are not recorded in the main pedigree (2, 3, 5). 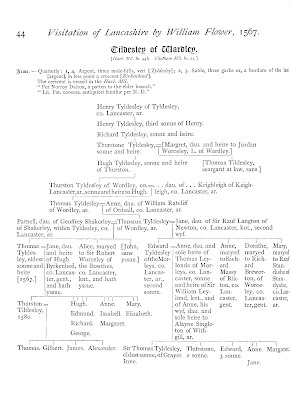 The Wardley pedigree includes: Henry Tyldesley of Tyldesley, Henry Tyldesley, Richard Tyldesley, Thurstan Tyldesley who married Margaret Workesley, Hugh Tyldesley, Thomas Tyldesley, Thurstan Tyldesley who married Mary Keighley (Flower does not provide her first name), Thomas Tyldesley who married Anne Radcliffe, Thurstan Tyldesley who married first Parnell Shakerley and second Jane Langton, Thomas Tyldesley who married Jane Birkenhead, Alice Tyldesley who married Sir Robert Worsley, John Tyldesley, Edward Tyldesley who married Anne Leyland, Anne Tyldesley who married Richard Massey, Dorothy Tyldesley who married Richard Brereton, Mary Tyldesley who married Ralph Standish, Thurston Tyldesley who married Margaret Norreys, Hugh Tyldesley, Edmund Tyldesley, Richard Tyldesley, George Tyldesley, Anne Tyldesley, Isabel Tyldesley, Margaret Tyldesley, Mary Tyldesley, Elizabeth Tyldesley, Thomas Tyldesley, Thurstan Tyldesley, Edward Tyldesley, Anne Tyldesley, Jane Tyldesley, Jane Tyldesley, Margaret Tyldesley, Thomas Tyldesley, Gilbert Tyldesley, James Tyldesley and Alexander Tyldesley.